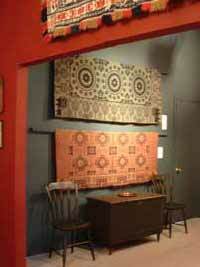 In May of 2006, the Museum celebrated the opening of its Interim Gallery in a portion of the Museum building. 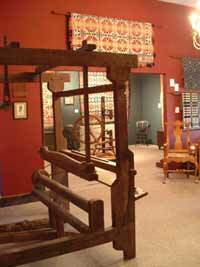 Several coverlets were placed on display, along with a barn frame loom, several weaving/spinning implements and more. Since that time, the Museum has expanded considerably and now enjoys over 5,000 sq ft of display space. 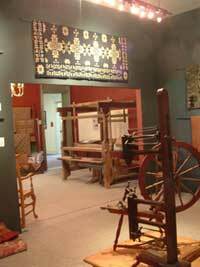 Visitor admission includes a tour, and exhibitions change periodically. Stop by and see our wonderful 'period' building, or contact us. We would love to meet and talk with you about our plans, programs and facilities. Do you wish to become involved? Let’s talk about that too!